Learn to speak German without grammar study, based on a theory of Stephen Krashen. I am an enthusiastic supporter of Stephen Krashens way of approaching a foreign language the natural way. I myself am currently learning my third foreign language following his methods, Italian. Mi piace! According to Krashen, improving a foreign language is a product of a subconscious process very similar to the how children acquire their first language. It requires meaningful interaction in the target language, with the focus on the content and not on grammar rules. The best results are achieved when the learner is motivated to communicate on a level which would not (yet) be able to speak but can still understand. My personal experience is, that basic structures of a language like verbs conjugation, syntax and a certain vocabulary standard (like level A1) is the best base for switching to the method of Stephen Krashen. At "Deutsch im Weinviertel" you will hear, read and discuss fascinating themes, meet interesting people and become a real "Weinviertler". You will gain new insights in your personal development by many motivating exercises. 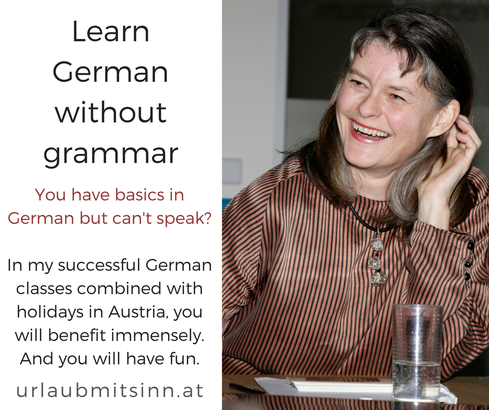 The German language will be a natural part of your holidays, and will conquer your subconsciousness steadily. See the next dates here.